When I had done a cursory search to find a wing spot, the images of Atlantic Social led me to believe it was much smaller than it actually turned out to be. The interior is split into three major parts, the first being a wrap-around bar with several tables surrounding it, the second being a large dining area with enough seating for (I’m estimating) around 80 or so people, and the third being a game room towards the back with a couple of arcade cabinets, comfy leather couches, a shuffleboard table and various other accouterments. The walls in the bar area (where we sat) were covered in photographs and memorabilia seemingly paying homage to the neighborhood and the past and present of Brooklyn sports. There seemed to me to be a bit of dissonance of trying to be both a trendy ‘upscale’ and ‘innovative’ restaurant while still attempting to be a neighborhood spot to watch the game. I’m so mad that I don’t have my own notes here because I really liked the exact quote we got from our server which I had written down on it, but paraphrasing will have to do in this instance. From what we were told, Atlantic Social is ‘taking everything that’s relevant in American cuisine right now and kind of putting our own spin on it.’ This ends up translating to a menu that is very sparse in its number of choices, but with wild diversity from dish to dish. You could find yourself munching on a pan pizza, chicken pot pie ramen, or a lemongrass pork salad (with sticky rice and papaya.) They have only one wing choice here, which is General Tso’s chicken wings. The PPW comes with asterisks for my imperfect memory, as I believe that the small and large were six and twelve wings respectively, giving a PPW starting at $1.83, and dropping to $1.66. This kind of goes without saying on the wing front, doesn’t it? AB and LB also split a pan pizza (they had been trying as many different pizzas as possible in NY, and while it wasn’t their favorite they did enjoy it) and I had their kale caesar salad which was amazing and I’m still a bit sad I forgot my leftovers at the restaurant when I left. As usual you’ll see the picture of these a little further down, but I don’t want to undersell the presentation here at all. We were given ample plates, napkins and wetnaps before the wings ever hit the table, along with a designated bone plate that was decorated in a Chinese-style design. The wings themselves were served on a deep rectangular platter with a side of Chinese broccoli, and came out in a pile looking much like a gorgeous pile of General Tso’s chicken, with clumps of crispy panko breading, red chilis and stirred with sesame seeds. While it was a bit messy looking, I feel like this was the intent, and I was very impressed by the presentation from top to bottom for these, 5/5. I mean, yes, I know General Tso’s isn’t actually a traditional Chinese sauce by any means but I still love the taste when it’s done well. As LB’s notes are the only ones I still have in my possession, I’ll give her thoughts. “The wings were sweet with a kick, exactly what you want with General Tso’s chicken.” I agree here, noting specifically that both the sweetness and the heat were applied very well. With repeated wings, the sweetness got to be a little much, but was balanced really well by a nice increasing burn that in no way overstayed its welcome and faded fairly quickly unless you were wolfing them down one after another. The panko clumped into little crunchy bits that were a pleasant addition but at times were stuck so thick that it seemed a bit superfluous. It’s a great sauce that could use some minor improvements, but is easily in the realm of a 4/5. ‘Meaty’ is the first word that comes to mind eating these. They were definitely really large wings, and didn’t suffer from the sometimes-problem of sticky sauces in losing their flavor, but instead remained tender and juicy the whole way through. On the other hand the sauce used does negate any enjoyment one might get out of the skin itself (which is usually one of my favorite parts.) There were some minor inconsistencies in the size and meat of the drumsticks, but nothing I would call deal-breaking, though more than one of them had broken bones which adds a bit more gnawing to the process than I usually like. It’s a damn decent wing, all said and done, with a bit of room to improve in the care and the consistency, 4/5. Were I more local to the neighborhood, I still don’t think I’d be much of a regular at Atlantic Social. It’s a gutsy move to not only serve one type of wing, but to have it be a relatively non-traditional style and sauce, and it pays off for them. My biggest deterrent to giving a glowing recommendation here is the pricing, but they’re still far from the most expensive wing the Wreview has come across. They aren’t the best wings, but they are incredibly good, and worth trying at least once, despite whatever reservations I hold. 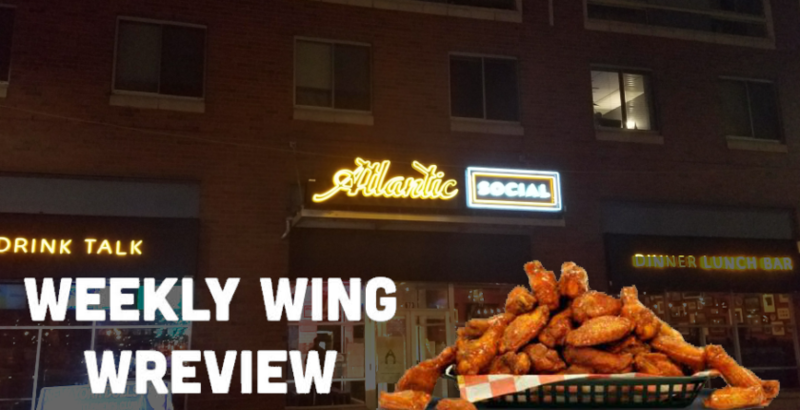 Whatever you may think, the wings at Atlantic Social are at worst interesting and competent, and you could definitely do worse than trying them out, 4/5. I’m so sorry for my scheduling inconsistencies of late, and while I am dedicated to keeping the Wreview a Weekly one, I am aware that I’ve been missing a few here and there in the last few months. I’m still working hard on getting ahead of the curve here, and I appreciate you all being patient with my sometimes erratic posting schedule. Also, if you’ve checked out a place because of the Wreview, I would LOVE to hear from you! I get a decent amount of in-person feedback from readers, but I can sometimes be a bit of a recluse so I may not have met you in person, but I genuinely am thankful for everyone who has been sticking with me week after week. Feel free to tell me if you think I was right or wrong about something, all criticisms are welcome. And as always, if you want to become part of the WingSquad, let me know! All of these things you can email me about at the address below! Besides MaxFun NYC events, you should also be checking out Nerd York City and The Skint for cool things to do.